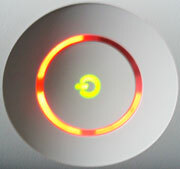 Right as we go into that busy time of year for gaming my second Xbox 360 has kicked the bucket. It’s no more. It’s ceased to be. It’s expired and gone to meet its maker (in a cardboard coffin). It’s a stiff. Pushing up the daisies, etc, etc, etc. I’d suspected it was coming for a while, since the drive kept spinning down randomly and audibly struggling to focus on a disc, and sure enough it froze up while playing Halo 3 on Monday. It froze again on the title screen when I restarted, and then on the third attempt it froze on the 360 splash screen. I could hear the death clock ticking. No graphical corruption, unlike the first time, but you know what’s coming when a 360 starts to play up. After a night unplugged, it made it a few minutes into Half-Life 2 before freezing, and then wouldn’t even make it to the dashboard without freezing. But it hadn’t red ringed yet, and there was no chance that I was paying for repairs again. I started to look for ways to induce the rings to qualify for the warranty extension, ultimately just turning it on and off repeatedly until, after less than a minute, those evil lights revealed themselves. In any case as soon as the replacement arrives it’s getting traded in towards an Elite or 65nm and HDMI-equipped Premium.